Senator Mike Lee (R-Utah) and Congressman Tom Graves (R-Georgia) have introduced a bill to eliminate federal involvement in transportation policy, which would spell disaster for funding that supports transit, biking, and walking. A largely symbolic vote in favor of “devolution” will allow Republican members of Congress to demonstrate their conservative bona fides. The Transportation Empowerment Act (TEA) — get it? — is sponsored by 21 lawmakers, all Republicans. The Hill reports that the arch-conservative Heritage Action group will be scoring lawmakers on how they vote. The bill would reduce the federal gas tax from 18.4 cents per gallon to 3.7 cents over five years and turn all spending decisions over to state governments. Under the current highway bill, Moving Ahead for Progress in the 21st Century, at least 25 percent of authorized funding for FY 2013 was diverted to non-general purpose roads and bridges. Transit, the largest diversion, received $8.5 billion, or 17 percent, of authorized funds. Other diversions include $809 million authorized for the transportation alternatives program (TAP), which pays for bicycle and nature paths, sidewalks, and community preservation activities, none of which reduce congestion or improve mobility for the motorists paying for them. Heritage remains oddly silent on the massive subsidies that pay for roads. Nor do they seem to notice the enormous, wasteful boondoggles perpetuated routinely by states. And Heritage doesn’t seem convinced that making transportation systems more efficient in the nation’s economic hubs, lowering the death toll from nearly 34,000 traffic fatalities per year, and reducing dependence on fossil fuels are in the national interest. Your state might not lie along a major freight corridor, but freight bottlenecks and delays cost all of us. Conservative lawmakers have been trying unsuccessfully to enact devolution since the mid-1990s. House Transportation Committee Chair Bill Shuster (R-Pennsylvania) has made it his mission to persuade even the most conservative of Republicans that the founding fathers and free-market thinkers including Adam Smith intended a strong federal role in transportation — and he intends to keep it that way. How soon these short sighted politicians forget. The purpose of Federal interest in roads, and surface transportation in general, has been long standing. The 1919 U.S. Army Transcontinental Motor Convoy**, a post WW I effort to find out how long it would take to move troops and supplies cross country, averaged a paltry 5.7 mph (one could do that on a touring bicycle) getting what amounted to an army company across the country on the nascent Lincoln Highway. A Lt. Col. Eisenhower was a member of that effort and together with seeing the German Autobahn, convinced him that the Federal government had a strategic interest in ensuring excellent transportation systems in place in advance of when we need them. I’m sure that is why the Federal Aid Highway Act (i.e., the act that created the Interstate Highway system) was passed under his administration. I don’t think that strategic interest by the Feds has diminished. Perhaps it has expanded, i.e., in addition to the need to move strategic goods and people in a crisis (whether a military one or a civilian crisis such as Superstorm Sandy), we need to plan for a future that is less reliant on fossil fuels and that uses energy wisely. This cannot be done patchwork. 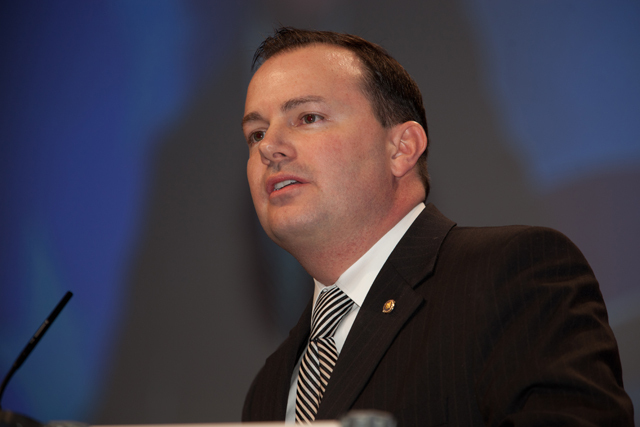 Mike Lee and his ill-advised cohorts fail their history lessons at our peril. Funny how most of those top ten states are quite red, eh? 1.4% of people in republican held house districts take transit as their primary commuting method vs. 8.9% for democrat held house districts. It explains a lot, especially for a party that don’t seem interested in winning over new voters. http://www.theatlantic.com/politics/archive/2013/11/there-really-are-two-americas-republistan-and-democravia/281412/ Data at the bottom of the article. Sometimes I wonder whether “devolution” would actually be a good thing by putting highways and transit on a more equal footing. From a simple perspective of economics, which project would you choose? I too favor the federal government getting out of the roads business. A lot of car-only highways would not exist if states and cities had to pay their own money for them. The poster child for this is Boston’s $24 billion “Big Dig.” Which, thanks to the well-known phenomenon of induced demand did zero to reduce congestion. it just moved the bottlenecks around. And wasted $24 billion in the process. If the City of Boston and State of Massachusetts had to actually pay 100% their own money for the “Big Dig” it never would have happened. Not-so-right-wing Canada has this system in place. The central government is not in the highway business. That’s 100% paid for by the provinces. (Yet, nit-pickers, there are a few exceptions like military bases, Indian reserves, regional development, etc). As a result, cities like Vancouver have zero car-only expressways. And are much better cities as a result. Khal, your car bias is showing. Probably unconsciously. In 1919 troops and supplies would normally move cross country by railway. Fast and efficient. This being Streetsblog, I am also surprised to not see more analysis of why it might not be better to have 90% of transportation policy, planning and funding devolved to the states. Some things do need to be at a national level – aviation, interstate & freight rail, interstate highways. But for a good chunk of the formula and competitive grants, why wouldn’t it be preferable to get the feds out of the picture? Besides removing a bias against urban areas and allowing better policy to flourish, it seems like people have a much better sense of the true cost of their services when they are paying for it in a more direct way with a more visible connection — and are therefore more willing to pay for it. Mike you aren’t going far enough, and neither is the Heritage Foundation. The gas tax should be kept as an air pollution tax, but I favor federal transportation spending going to nearly zero. The FAA, the NTSB, other regulatory functions need to be federal. But I don’t want decisions in Washington anymore. How about having the feds pick up a larger share of Medicaid, or some other direct to people service, to make the states whole? But localize the decisionmaking. I for one am not afraid of entitlements and defense taking over the federal budget. A lot of mistakes in housing, transportation, infrastructure etc. would have been avoided if that was always the case. Seems like directing the money straight to cities would be fine and an improvement on the status quo. But what these guys want to do is leave everything up to states, which have a horrible track record. If this proposal passed, you’d have less money going to city transit and bike/ped, and more to highway boondoggles. The problem is not “devolution” per se, it’s leaving everything in the hands of the worst level of government. Of course, Heritage and all the rest have no interest in letting city and local governments handle the bulk of transportation funds, because that would ruin their highways-only agenda. It would be difficult to rebuild the national passenger rail network by leaving it up to the states. But perhaps that’s the other 10% you referred to. They just want to cut off the federal money (though not all of it). Who makes up for it would remain to be seen. That’s because they don’t propose cutting it to zero. And that’s what we need. Zero at the federal level. Perhaps it is showing, Kevin. I suspect there is more than just a tad of anti-car bias on Streetsblog as well, eh? Rail *is* surface transportation, although its a shame so much of the old rail system no longer exists except as bike paths. I think the Feds should have an interest in interstate transportation and mobility and in transportation needs that are of a national or strategic nature, such as ensuring there is good connectivity to strategic resources such as bases or ports or population centers not only for economic vitality (cities, ports) but also in the event of an evacuation or supply emergency. As far as what is needed whether it be rail or road would depend on the specifics. Recall that during the Battle of the Bulge, it was the strategic confluence of roads, not rail, that made Bastogne so important. Not sure rail would serve the needs of another superstorm, but neither do roads unless good planning and geography prevail. Bad planning trumps good transportation. No one had any idea how to evacuate Long Island, for example, if Shoreham Nuclear Power Station (I once lived less than ten miles away) were to have a major accident; the LIE, Northern State Parkway, Southern State Parkway, etc, are parking lots under even normal circumstances. I’d have gotten off Long Island faster on my Cannondale. Hence Shoreham was cancelled. States have an interest in what happens inside their borders or between adjacent states. Sometimes these are hard to untie. I suppose one can count on state agreements between each other, such as NY-NJ-CT-PA. The Feds have traditionally thrown money at highways and have a terrible bias towards highways rather than the needs of urban areas and that tends to create a self-serving and perpetuating constituency. Combine that with race and class bias and we have the perfect storm. That doesn’t mean the states are much better. New Mexico, for example, currently ranks close to dead last in the LAB Bicycle-Friendly State evaluations and that is one instance where I’ll gladly buy LAB Exec Director Andy Clarke a beer in support of their analysis. Perhaps that is because our state exists at the teat of the Federal bureaucracy, but not sure how to change it for the better. Perhaps left to its own devices, NM would continue to build more US 550 four lane highways to nowhere while letting urban transportation languish with 1960’s designs, which is what the NMDoT has been doing since I’ve lived here. Even Albuquerque, a somewhat progressive and Bronze Level BFC, has its administration putting the I25/Paseo del Norte Interchange above virtually all else. Duke City residents by and large drive. So to me, cities and states are not necessarily an acceptable alternative to bad Federal planning. Or maybe not….wanna trade crystal balls? Highways and rail lines by their nature transcend state lines while bicycle, bus, and walking are local issues, albeit ones with national impact (health, pollution, fossil energy dependence). How one manages surface transportation to make it less biased towards highway links to nowhere while ensuring national continuity in standards is a good challenge, regardless of the scale of interest. My problem with Lee et al is I think they are knee jerk conservatives who are wedded to special interests and who see solutions to their pet political points of view rather then addressing problems needing to be solved in a less ideological manner. I’d love to have an honest, non-car-centric conversation at the Federal level. There is a model for massive “local” road funding: Robert Moses’ TriBoro Bridge and Tunnel Authority, and the Port Authority of New York. Yes, we got some very impressive bridges and tunnels built. Yes, they got built without direct federal, state or local taxpayer financing. But, in the case of PORT, NY Metro got the Holland Tunnel instead of the unified freight railroad tunnels and cross regional tracks that they were chartered to create. We are still dancing around the critical need for a Cross Harbor Freight Tunnel. Ninety years later! In the case of Moses, yes, people can drive across the Red Sea without getting wet – OK, the Narrows, the East River, the Harlem, Jamaica Bay. But in too many cases, they can ONLY drive. Moses did not include pedestrian or bike access on the newer bridges, not in any of the tunnels, and removed it from the older Bronx Whitestone. Moses drained the city of federal subway funds to build his Parkways – like the Belt – that were critical to the operation of his toll bridges and tunnels. In Queens, Moses decided that no subway was needed along the VanWyck to Idlewild – JFK airport, even though 1000 feet of turnout was built from Queens Blvd – that eventually became the Archer Ave Line. Moses also squashed the Horace Harding Line – that would have been built along with the LIE. Moses TBTA and PORT didn’t use direct tax funds, rather they used toll revenue collected at their “Critical Path” bridges that no-one could avoid. Instead of the “tax man”, the region had the Troll at the Bridge demanding the Toll. Those tolls funded their empires. I have worked with many state DOTs. Unfortunately, they are not the brightest of bulbs. Congestion can Always be solved by enlarging the roads and the parking lots. There is no second iteration in their thinking; that there is pent up demand, so more roads and parking will encourage even more driving and parking, in a death spiral to gridlock or worse. Worse? Robert Moses worked up a Final Solution to the Manhattan traffic problem – the 80:20 Solution. Twenty Percent of the land in Manhattan would be devoted to high speed – grade separated roadways, and the remaining Eighty Percent of the land would be devoted to parking lots. That there would be absolutely no reason to bother going to a Manhattan covered by roads and parking lots does not diminish the elegance of this Moses 80:20 Solution. This 80:20 Solution more or less mirrors what present day Detroit looks like…. I put more faith in the US DOT, despite some of the politics and bias and incompetence of some of the staff, that they have a coordinated, comprehensive and continuing interest in what is best for moving American people and goods from where they are to where the want to be. U.S. DOT is not in charge. Congress is. If transportation were locally funded, some states would be held back but others would move forward. The federal government could pull the whole country backward. My state government is one of the worst, but I’d still rather that decisions on the margin made there than in Washington. Robert Moses was a long time ago. And without federal money, and lots of it starting with New Deal money for the Triboro Bridge, he’d have done a lot less of the things you object to. Some of them have pretty low population density as well, which might explain things a little more accurately. Even with recent growth in ND, you still have ND, SD, WY, MT, ID, and AK that really don’t have that many people in them compared to places like CA and NJ. But do all the states have a bad track record? You can find bad examples everywhere, but there have to be some states that are better than others. County or city/town is the level at which bike/ped infrastructure is decided, and I would hope that places that already have good bike/ped infrastructure would keep fighting for that state money if the federal money went away. You’re really just seeing the ratio between interstate highways and non-highway roads. California has a crap-ton of non-highway roads that service huge traffic volumes. North Dakota not so much. There’s a big difference between letting states make the decisions and letting cities or metropolitan regions make the decisions. The state of New York has a lot of concerns that don’t involve the economic activity on a few islands off its southeast corner. And the states of New Jersey and Connecticut really don’t care about what goes on there. But if you got the mayors of a few dozen towns around NYC to agree to a unified regional taxation package that would fund metropolitan transportation, you’d probably end up with something better than what the feds come up with, and definitely better than what three separate states operating independently would. No, they actually do propose (for at least a period) that the federal government keep spending a certain amount of money on transportation, but doing it by passing it on to the states as block grants, which they can use however they want. That might be true if states were local entities. But other than Delaware and Rhode Island, and maybe a few others, most states are just like the nation as strange agglomerations of urban, rural, suburban, and everything in between. Decisions for East St. Louis are no better off made in Springield, IL than they are in Washington, DC. That doesn’t quite explain Utah and Rhode Island, but it does seem to be a lot of what’s going on. At some level regional planning needs to take place – with that said, no state legislature would ever agree to spend the lavish amounts of money on things the way the feds do. It would be the end of vast interstates and more NJ Turnpikes – that is broad support across the state to fund the thing and devise a means to maintain it. The current system encourages states to develop projects that win federal grant money – not projects that everyone involved understands and supports getting done. The subway was subsidized by the city of new york’s dual contracts because the elected officials agreed that it needed to be done. It is much easier to convince a rural legislator 200 miles away from your city to fund your local needs than a congressman from 2000 miles away. The bill would amount to a tax increase of more than $200 million annually on American transit agencies.